On the eleventh day of Oscar Pistorius trial, the court has heard from a firearm specialist that the athlete had good knowledge of the rules on gun use and dealing with intruders. Oscar Pistorius said one could discharge a firearm if one feared for one’s life. The Paralympic champion denies murdering his girlfriend Reeva Steenkamp last year, saying he mistook her for an intruder. The prosecution says Oscar Pistorius intentionally shot Reeva Steenkamp after an argument at his house on Valentine’s Day 2013. Sean Patrick Rens is involved in firearms assessment for licenses and met Oscar Pistorius in 2012 through a mutual friend. Oscar Pistorius had bought a gun from Sean Patrick Rens, a Smith and Wesson 500, day 11 of the trial heard. He then ordered six more guns from him. The order was cancelled a month after Reeva Steenkamp was killed. Sean Patrick Rens read out a competency questionnaire and examination that Oscar Pistorius had completed before he could be issued with a firearm. He scored top marks in these tests, which included questions about the rules on when you are legally allowed to shoot intruders. Sean Patrick Rens also relates an incident when Oscar Pistorius told him about going into “code red”, or “combat mode”, after hearing a noise in the house and thinking there was an intruder. Oscar Pistorius, 27, got his gun and cleared the house by drawing his gun and checking rooms, Sean Patrick Rens said, and when he got to the source, he found it was a tumble drier. The questioning of Sean Patrick Rens at the end of his testimony was the briefest cross-examination of the trial by Barry Roux. The next witness was police crime scene photographer Bennie Van Staden, whom Barry Roux accuses of failing to label his pictures correctly. Bennie Van Staden was called to the scene at around 04:50 and took pictures of the accused and the deceased, as well as pictures in the different rooms of the house. His photographs show the bloodied bat Oscar Pistorius used to smash open the bathroom door, the damaged door itself, blood-soaked towels, two mobile phones, blood puddles on the bathroom tiles, as well as the toilet bowl covered in blood, with streaks on the inside. Bennie Van Staden says that you can see the date and time of the photo in his pictures, rejecting defense claims that his picture timeline was jumbled or unclear. He explained how he set out cones to highlight certain objects in the bathroom, e.g. cartridge cases, and moved some objects for visibility. The trial has now been adjourned until Tuesday. 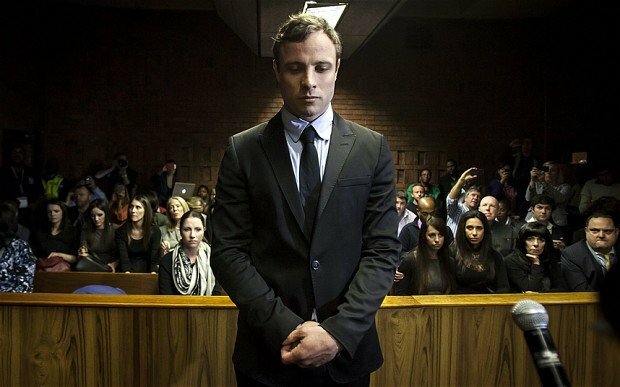 Oscar Pistorius trial is expected to call on more than 100 witnesses. It had been set to last for three weeks, but looks likely to be extended.